Cookies & Candies: Why do we buy new clothes when we wear the same all the time? Why do we buy new clothes when we wear the same all the time? 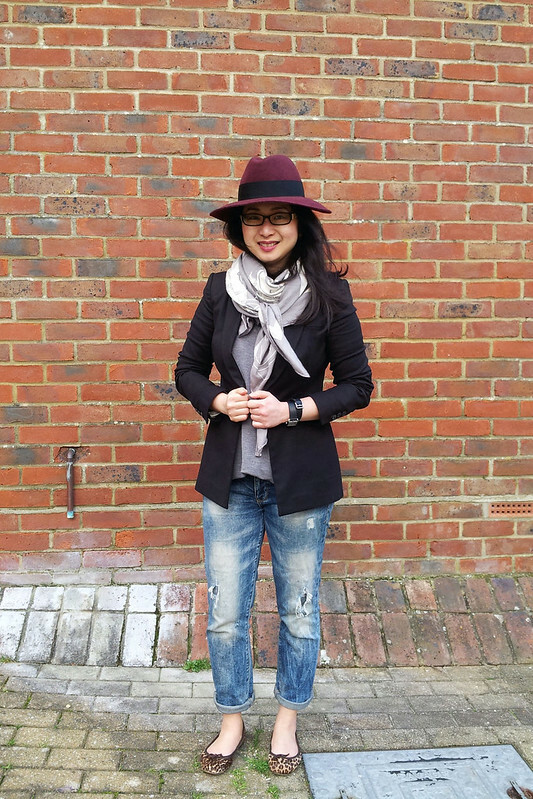 Outfit: Zara blazer, Alexander Wang t-shirt, Zara boyfriend jeans, Hermes belt, Hermes Cape Cod watch, Hermes cashmere shawl, Repetto flats and Christys fedora. The feedback I'm getting is that you prefer to see what I REALLY wear and it doesn't matter if it's the 18457837264th time that you've seen my infamous boyfriend jeans/sweats/flats etc. Is that right? If it is..........whew! Because.... I'm no trendsetter. I can't be arsed thinking about what to wear every single day. If it hurts, I'm not wearing it. If I can't squat/sit/walk/bend, I'm not wearing it either. And if I really really really REALLY like something, I will wear it again and again and again and again. Like these boyfriend jeans from Zara. I still dislike being the subject matter in the front the camera because I love pressing the button more than posing (same pose, different day). The idea of taking selfies is completely lost on me. I used to follow a whole bunch of famous bloggers until I was inundated with selfies ALL day long. Surely, there are more interesting things to photograph other than your own face?? Lately, I had a look at my half arm span sized closet and 3 drawers and started to hyperventilate. Some may say.....pffffffft....... small closet. True. But when I had to dig around a whole bunch of stuff to get to the same-tshirts-that-I-wear-everyday, I know I own waaaaaay too much unnecessary crap. Why is it that we feel compelled to buy more clothes when we wash/dry/wear the same few pieces ALL the time? while i admire you for consistently being adamant to be real and show what your daily look is like, i also think there's a false humility side in it by the way you splash the brands you're wearing. you're wearing high-end, luxe items (with a dose of high street) everyday, on a typical day, and that's what's normal for you, is that what you're saying? and you speak of other bloggers posting selfies to the point of inundating you, yet you contradict that by posting your own, and by-lining it with designer names that a 'real, normal, typical' person does not wear everday. i guess i don't .. understand your point. Right. Let's talk about selfie. It's a SELF portrait. This is NOT a self portrait. Since we're arguing about semantics - My daughter took this. Now. Point two: I used to do collages of my outfits but readers wanted to see how they're worn on a real person. After 2 years, I relented. Point 3: designer clothes. We have our own self values. Some prefer to spend money on cars. Others prefer to spend on shoes. Who am I to tell other people how they're supposed to spend THEIR money. I never EVER say that I'm posting photos of what a normal person would wear. I say this is what I (emphasis on that word) wear on a normal day. Don't make a mistake about the two. Let's go back to designer clothes. I buy what I like so yes, at times it's Zara, sometimes it's Petit Bateau. I wear the odd Hermes. I spend MY money. NOT yours. So if that offends you, then kindly avert your eyes. Thank you, H for the support. Personally, I would never dream of typing out a comment like the one on the very top on someone else's blog. It's taking something completely out of the context. I guess it's always easy to judge provided there's no one to judge you. I get what anonymous is saying. They are not being judgmental, just a real observation. Go Marlene! There is a big difference between selfies on Instagram and outfit posting on a lifestyle/style blog such as your's. And there is no point in trying to explain it to someone who doesn't "understand" that. No one is forced to read your blog and, as I always say, unless you owe somebody money, it's none of their business how much you spend on anything. You don't even have to justify yourself, sweetie. Thanks, Maria. I've been a bit harsh on Anon. I guess everyone has certain price threshold for everything. What seems extravagant for one, may not be for another. Some prefer luxury accommodation while others prefer spending money on food. We're all different. I'm doing more OOTDs these days though it's not the easiest thing to do. Kudos to all the incredible personal style bloggers out there. I feel like blogs about apparel get boring fast if you can't see what the apparel looks like in real life. There is a difference between what a Polyvore collage looks like vs how those things look on a body, together. I don't personally like it all that much either but I feel like it's not really walking the walk to not do outfit photos from time to time. Very true. I LOVE seeing how clothes look on others but rather eeeek about being photographed. But I totally get why it's better to see how the clothes fit and drape on a real person that a static collage. I hate putting my picture up too, it makes me cringe inside bur readers love it, so I do a few every so often. I also don't understand the rampant egotism of folks who post their selfies online every day although, maybe it's not egotism, maybe it's part of modern culture now , I'm too introverted and part of the older generation to grasp it. I guess I'm part of the older generation too. I'm not anti-selfie because it's lovely to see the face behind a blog but it's the frequency on Instagram. The only option I have is to take my own photo - is that a selfie? Or is a selfie of your face? We had this discussion in the office yesterday and no-one could come up with the correct answer! I love seeing how you dress. Our budgets are so far apart but that doesn't matter. A £500 jacket is the same as a £25 jacket to me. It's how we put our clothes together that interests me. Since my budget for clothes right now is £0 I am learning to love more and more about what I already own and not to keep on buying the same old same old variation on a theme. Keep up the lovely posts :-)! Aww....thanks, Fiona. You've always been a wonderful friend and cheerleader. You still owe me a visit. Anonymous - I guess missed the part where Marlene said this is what a "typical" person wears. She said this is what SHE wears and so what if it's a mix between designer and high street? That might not be what you personally wear, but who cares? Wouldn't it be super boring if everyone wore the same stuff? Marlene - I think you look great and do a fantastic job of showing that one can wear Hermes casually. Thank you, Abby for the support. I don't have a lot of clothes because I like them to last. Whether it's high end or high street, it shouldn't really matter. I think having a small place really makes me a bit more vigilant about what I buy. I simply don't have the space for tons of clothes (nor the budget!). Marlene, that outfit looks great. I love how you consistently combine high-end with high street, and focus on quality, handmade items that will last forever along with pieces that are easier on your wallet. I think maybe the selfies you're talking about are bloggers who inject a photo of their mug in every single shot no matter what they're talking about, which is conceited indeed. Please keep showing us your real outfits. As for why we want to buy new stuff when we only wear one third of our wardrobe, I think that's for psychologists to try to figure out! I guess we could be bored and want the thrill of something new, or we see what others have and want it for ourselves. I'm trying to pare down my closet and it's hard. Luckily most of what I buy is second-hand (charity shops and consignment and car boot sales) so I can literally afford to acquire and get rid of things, but it's a vicious cycle. Please ignore Anonymous, who couldn't even be arsed to give their name. That comment was rude. You deserve better. Thanks for keeping it real! Thank you, Laurel. Yes, you're right. Everyone does the odd selfie now and then but it's different when it's 5-8 a day and it really clutters up the Instagram feed. I shop at consignment stores too. And at sales. Mind you, I just bought something I don't really need. Now I feel like an idiot every time I see it hanging there unworn. Coming from NZ, I was like a kid in a candy store when I saw how far £100 can go in a High St store. So I bought and I bought and I bought. And realized I hardly ever wore any of them. What a waste. I've found some little precious treasures here and there at High Street stores but I guess the trick is not to get too carried away - like I did initially. I do sponsored posts occasionally but only because I have personally bought from there and I genuinely like the brand (speaking of which, there's one coming up so you've been warned). Fortunately or perhaps unfortunately, this is quite rare. Most bloggers I know do for the love of it and rather enjoy the camaraderie between the readers and ourselves but there's little money to be made from this very time consuming (and expensive) hobby. It's because I have a lot of stuff and a lot of real favourites that I don't want to wear out, that I rotate everything around so much! I'm scared to keep washing washing washing my favourites in case something happens. So although I'm not constantly buying I am happy that I wear 90% of what I own. Good for you for rotating your clothes. I'm terrible. I end up wearing the same stuff until I'm sick of it and then move on to the next lot. Hey Marlene. You look super cute and stylish in this outfit. I love it and everything about your blog. Keep up the good work. Lots of love to you and yours. Thank you. That's really sweet of you! Whether you like being in front of the camera or not, I love seeing you in your outfit posts - I find them inspiring and achievable and gives me a lot of ideas for my own day to day wear. Whether you're carrying a Hermes or a cotton tote is by the by for me - I just adapt to my own budget. And I think ultimately, that's what people should take from it - the idea. As for pointless selfies - I've unfollowed so many Instagram accounts where it has bordered on mind numbing. And why do we keep buying new clothes even though we wear the same old, same old? I have no idea - like Laurel says - that's for the psychologists to work out. Yup, totally get what you're saying. I can't afford some of the clothes from a few of the blogs I read but hey, if I'm inspired, I'll see if I can try other cheaper alternatives. I'm certainly not against selfies per se though it's not for me but what I get numbed with is just tons of selfies in ONE day. Thank you, Jill. You along with the other ladies have been incredibly supportive and kind. It's always easy to hide behind the cloak of anonymity and say what you wouldn't say if you're face to face with the person. I can't afford some of the things I've seen on other blogs and you're absolutely right, we adapt accordingly depending on our budget. Marlene, good on you for not editing out the somewhat aggressive post by A N O N . It opens a lively debate which proves that we all love your style and honesty. I love mixing Hermes with high street and dress like that on a daily basis . If I want to see bloggers who dress in bling or in M and S I can see that too , but I choose to read just the two or three blogs which mirror my own taste, thank you very much! I decided quite some time ago that I wouldn't moderate the comments. The only time I would delete comments would be when they're too rude for the general public which thankfully are few in between. I've learned a lot from readers like yourself, see a different perspective because we're all very different. I can't agree more with the cost per wear. I've been naughty recently which is why the closet's getting a little too cluttered. Some of the so called "cheap" purchases haven't been all that cheap. I love this set of conditions - I try to abide by the same! "If it hurts, I'm not wearing it. If I can't squat/sit/walk/bend, I'm not wearing it either. And if I really really really REALLY like something, I will wear it again and again and again and again." I love that you really wear your stuff - I'm getting better at that but I still have too much. It's that darn Jcrew Catalog. And it's that darn, perfectly curated Isabel Marant rack of new items that slays me! Same here.....!! I'm just holding on till the sales season hits. I think when you're spending a decent chunk on something, it's good to be wearing it all the time. God knows I wish I did that more often, although am making a much more concentrated effort now that's for sure. I've been experimenting with a few different silhouettes and colours, so while I'm shopping, I'm just trying to broaden my options rather than buy extensions of what I already have, but you have a point. It's always buying the same things, and sometimes it takes stepping back for a moment to realise, do I really need 5 black t-shirts? At least you're experimenting. I've decided, that's it. NO MORE sweats. Love ur personal style, it's you! Thank you, Kayin. I think I would wear more of my other clothes here if it doesn't rain so much. I'm like you. My more formal clothes still have tags hanging on them. Shame on me. Marlene, quick answer to the first comment. Sorry to disappoint you and your readers but I do think anonymous (this person should have at least comment under her alias, not fair) had a "right" to ask especially as for me she was not really offensive. As for the selfie, for me it was a silly question because that's much better this way. Let's say that it this the camera that takes the selfie! Well now I am going to be banished from your blog because I am being honest? That said, you know that what you wear is not what I would wear but, nevertheless I feel good coming here and reading you, and this style suits you. As for buying, well it has always been ambivalent for me to buy clothes. I am a small and thin woman hence shopping has always been difficult for me. As a child we used, my parents, sisters and brothers to go every year before school started in september to a big parisian department (Le Printemps as it was back then, so much better) store and buy each outfits and shoes for the year. We were wearing uniforms at school anyway. As an adult I can thank my parents for a certain idea of elegance and good quality clothes so I was rather "classy" (but not posh) but always my own. I remember then buying at flea market (before it was trendy) leathers, furs, blouses, dresses. I shopped also wherever I could, including wearing my clothes from ballet dancing, as Zara, H&M and others did not exist yet (and made in China not so much too ....). I started shopping and buying less and less these past 2 years as I found my style (which is not following trends in any way) and what fit my frame. Also, I value quality above all, albeit I did shop at H&M and Zara. But not so much. I think I have reached the point when I can say that what define me now is not any more the amount of what I shop and wear. I have always been so far from what the other women were wearing at the time, but also always appropriate and, yes, classy. I do not casual on a daily basis, I cannot. I confess several obsessions though : shoes (ah don't remind me) but very good quality, scarves, leather gloves, tights and stockings and... black cigarette trousers. And being petite is quite a challenge believe me so I have to be more careful. But it is true that I tend too to wear the same kind of clothes IF NOT the same clothes. I believe in not moderating comments unless it's offensive. She wasn't been offensive but I wanted to clarify a few things. One is the misconception that she had that I represent the "normal everyday" person. We're all different with various budget, tastes, values and style. I can only showcase what I wear on a normal day. Secondly, I think both of you have misunderstood what I'd said about a selfie. There are Instagram feeds that are literally filled with self portraits - that's essentially what a selfie is. Taking photos of your own face, not body/torso etc. Nothing wrong with a selfie here and there but what I meant is having 5-10 photos PER day from the same individual. All selfies (face). I think you're lucky that you live in France where there are plenty of options for the petite women. It took me a long time to find a pair of well fitted black cigarette pants. Where did you get yours? Ah...well....I think most of us have the same issue - wearing our favorites and neglecting the rest. I've got several black pants along the years, all of the same kind: light wool, cigarette, normal to "high" waist. I found some at Gap, I've got one (expensive) from Joseph. A french brand that I cherished before it disappeared unfortunately was Et Vous, they did the most adequate black pants. So before they closed, I grabbed and stocked as much trousers as I could, black, grey, navy... I saw 2 at Yoox, one from Theory, the other one from Paul Smith which I admire. I think I am going to order both to try them on and, I hope, decide which one I should keep (don't say both ahem). And really this is not so easy to find proper and nice clothes for petite. Size 34 is not so common now and even when you have some clothes in 34 it is only to discover that it fits like a 36 or larger! I mean what's happened during the years, vanity sizing too? Finding shoes in small sizes is difficult also. I do not mind hemming my trousers and skirts sometimes (fair game) but I do mind having issues with the waist and hips. It is very often much too large at the waist for me and sometimes narrow at the hips: who is this alien!! I know there are petite ranges in UK (as in US) so I am looking forward to coming to London soon. Perhaps the anon poster would prefer that Marlene, who while wearing some designer goods in real life, pretends, for the sake of the blog, NOT to wear said clothes lest she offend/alienate readers...ugh. Alissa, we're all so different. I guess it's important not to judge. It's a good lesson for me too. Speaking of the Alexander Wang t-shirt, the grey material seems to be better than the other white one that I have. The latter pilled quite badly. I guess it's hard to please everyone. I've seen bloggers who tend to wear a lot of high street brands get bashed about buying cheap stuff. And then those who wear designer clothes get comments about how they're splashing branded stuff everywhere. I think the important thing to remember is that we're all different. Thank you, Michelle. I love your style and have picked up TONS of ideas. You wrap your scarf expertly. I read some quote about cartoon characters having the perfect style, because they wear the same thing every day. I tend to wear different versions of the same thing, and I definitely have my default mode. But I still nice to have those other pieces to mix it up with. I'm ashamed to say that this is the only way I know how to tie my shawl :P I do know what you mean. I tend to stick to my uniform. Most of us love fashion but are not overly obsessed with it.